I vaguely remember, many years ago, corresponding with Magica when the band was still in its embryonic stage. During our short-lived acquaintance I do recall there being a mutual passion for epic Melodic Metal. One decade and 7 albums later, the band still seems to possess a penchant for epic drama. “Centre of the Great Unknown” is a concept album even though the album’s dynamics wouldn’t suggest there being any concept (all tracks are 4-minute-average vocal compositions). In a nutshell the story concerns a fantastic voyage to the centre of the Earth. Magica are fronted by Ana Mladinovici, who is gifted with an excellent and solid voice. At times, though, I had the impression that her unconvincing diction and phrasing of the English language was weakening the impact of her singing. Sure enough, she sounds at her best in the bonus track, ‘Daca 2012’, which has lyrics in the band’s native Romanian language. But that’s not the only good track in “Centre…”. For instance ‘Mark of Cain’ is well-balanced with memorable riffs, catchy melodies and effective guitar solos. ‘No Horizon’ is an anthemic gem that effortlessly draws you into the music. 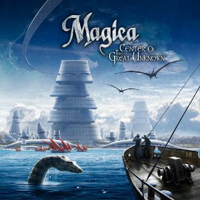 As such “Centre of the Great Unknown” brings nothing new to the genre of female-fronted Melodic Metal but what Magica do they do well and fans of the genre will doubtlessly appreciate this album. 05. The Earth is Young? ?